This fireplace is startling in size and is a logical and environmentally friendly option for any homeowner looking to combine style and high efficiency. Choose from four beautiful faceplate louvres to personalize your home. Large wood fireplace. Behind its large glass door, the 4.3 cubic foot combustion chamber can hold an impressive 60 lbs of wood. Low emissions. This energy efficient fireplace complies with the EPA’s clean-air standards with only 1.6 g/h of emission. High efficiency. 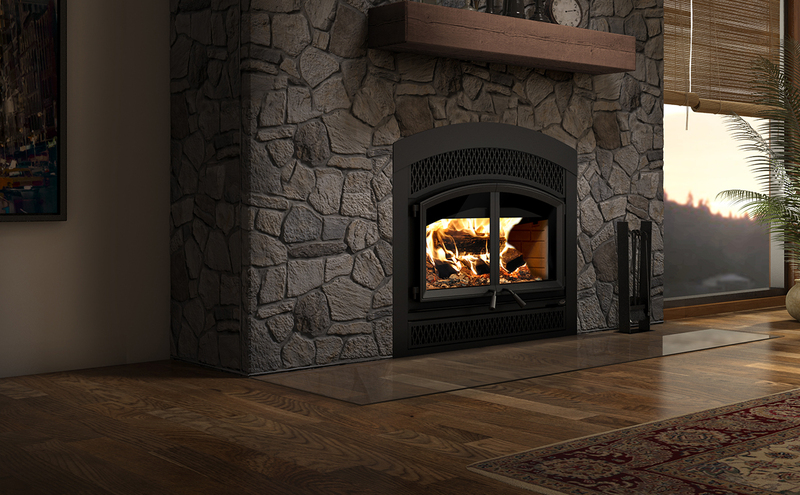 The FP15A fireplace is capable of heating large spaces and burns for 10 hours. Glass surface – dimensions (Width X Height) 29 3/4" X 13"
Overall dimension (Depth) 31 5/8"
Clearance – combustible side wall to unit 24" 24"
Clearance – top shelf to unit N.A. N.A.